This scenario of the future is completely logical. If microprocessor technology has now advanced far enough that a piece of plastic can contain all the computing and memory circuitry necessary to include your personal information, digital biometric data, and make electronic buying and selling possible, why put the chip in a vulnerable card in the first place? With a simple change in chip location, the financial industry could not only eliminate card and identity fraud, but also prevent the problem of lost-cards as well. In other words, why not put the computer chip directly on or within the individual who owns it? If smart card circuitry, including its microprocessor, memory, and the RF transponder for communication, were to be implanted just underneath the skin on the backside of the hand or on the forehead, the chip could still perform all the functions of a smart card but without the need to carry the card. Since the chip would be permanently attached to its owner, the combined problems of fraud, theft, or lost cards in a cashless society would be immediately solved. 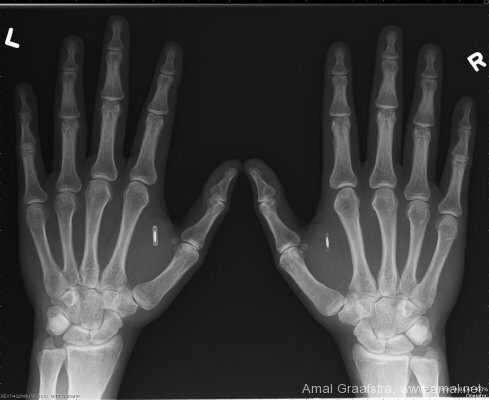 This type of implanted chip would be validated by governments or financial institutions to operate only with its owner as a result of the correlation between the biometric data stored in its memory circuits and the simultaneous scanning the owner’s unique physical characteristics. 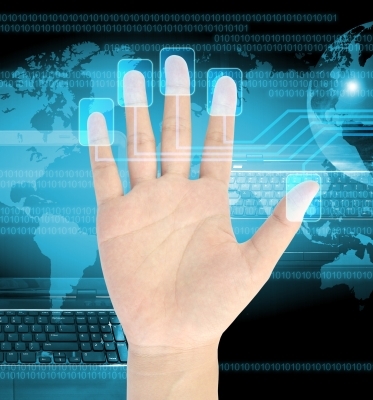 A person’s biometric identity would be scanned at the same time that the implanted chip makes RF contact with the EFT network at the point of sale. A chip implant would thus forever mark a person for participation in society, and without it they would be outcast and unable to buy or sell anything. “…the identifying information is put in the form of a microdot on a plastic, paper, or metal disk about 4 mm in diameter” (Chemical and Engineering News, May 27, 1985, p. 76). And where is the disk’s final location? In this case, the microdot of data is put on a tooth. The article stated that the disk can be marked with information using any currently available technology, “such as alphanumerics, strip, disk, or bar-line codes”. They went on to say that according to the patent itself, “When so prepared, the tooth—be it of a human or of an animal—is marked for life” (emphasis mine). Another viable method of producing a permanent mark of digital data on a person uses optical patterns made directly on the skin. Since the advent of barcode technology during the 1970s for retail product marking, it has become a strong possibility that humans could be marked with a tattoo that is very similar in design to the Universal Product Code (UPC).  The UPC is a form of product or item identification that is a particular subset of the Global Trade Item Number (GTIN), and it can be found on every item sold at retail. The UPC has enough digital capacity that it can theoretically mark up to 1 trillion items with a unique code. 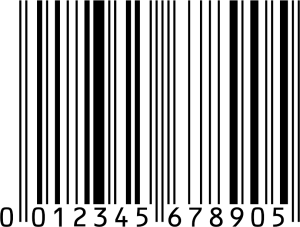 A similar barcode system, the European Article Number (EAN) is actually a superset of the UPC and it can mark up to 10 trillion items. 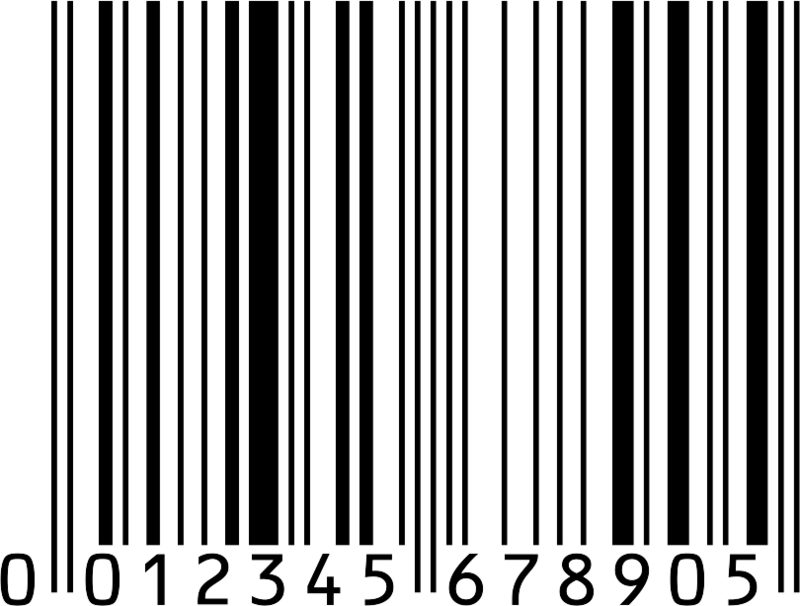 Therefore, a barcode similar to the UPC or EAN potentially could be used to mark, in addition to every product sold, every human being with their own unique digital number for identification. Such a system could indelibly ink the barcode directly into the skin of a person using standard tattooing procedures; however, in this case the process would be automated and validated by the state to provide an official number to each citizen, just as similar barcodes provide unique numbers associated with every commercial product. 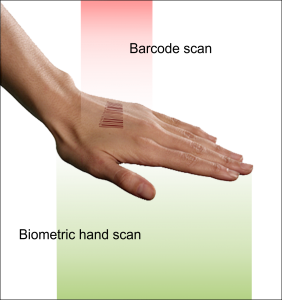 This process of barcoding people might even be done at automobile license facilities using a device that could be placed on the hand or forehead and the pattern quickly tattooed into the skin. To make the procedure sanitary, the tattooing device could incorporate sterile, disposable heads that could be changed after each tattooing process is finished. The procedure could even use invisible or minimally visible dyes that could be read in the near-IR region of the spectrum, thus making the marks cosmetically acceptable even on the forehead. This type of mark would have elements of the predicted Mark of the Beast as well as the Number of the Beast, because it would be required on the hand or on the forehead. In fact, it would actually be written on and within the hand or forehead as specifically required by the prophecy in Revelation. What is fascinating is that this type of barcode Mark would also incorporate within it the hidden ‘666’ control patterns at the beginning, middle, and end of each UPC or EAN barcode, thus manifesting the Mark of the Beast and the Number of the Beast combined together into one system (see the sections on 666). This is certainly intriguing from a Biblical perspective, but it remains to be seen whether this will become the final Mark as predicted in Revelation. In addition, the first of a series of books for young readers entitled the Bar Code Tattoo, life is described in a society where every individual is forced to receive a barcode on their body by law. The rationale used in the story is that the government wants to simplify everyone’s life by eliminating cards and official identification papers, so no one could lose them or have them stolen. Of course, in the book people who resist the government and don’t get the barcode are ostracized and prohibited from participating in society. Although the Bar Code Tattoo series of books is not about Biblical prophecy, it definitely mirrors what will happen to people who refuse to get the final Mark of the Beast during the reign of the Antichrist. However, it will be much worse for Christians at the end than the main characters in the book, since ultimately many people who don’t accept the Mark will be persecuted and put to death for daring to defy the Empire. “Iron oxide can be made in various shades of yellow and brown, cosmetically quite acceptable to most races (whites will be the hardest to color match). Once in place, the tattoo could be written to, or read from, by standard magnetic methods”. Jones described many uses for such novel magnetic marks as encoding all sorts of data, including name, date of birth, social-security number, blood type, credit card data, driver’s license details, workplace status, financial balances, while also functioning as a magnetic pass for security purposes. This form of marking system would be indelible, because as a tattoo it would be incorporated deep within the skin’s structure, but it would also function as magnetic recording media to read and write data to the tattoo as necessary. All of these methods of marking people with information at least in principle would be viable ways of fulfilling the Mark of the Beast; however, the information contained in an implantable microchip would be far more versatile than simple encoded marks. Studies have been done for over twenty years investigating the use of implantable microprocessors for a variety of applications. Not surprisingly, much of this research was directed toward the potential medical uses of the technology instead of its commercial applications. This involves the use of specially programmed microprocessor chips designed to be placed directly into the body for the continual monitoring of vital functions (such as heart rate, temperature, blood sugar levels, etc.). Advanced chips also have been used for the digital creation or enhancement of vision and to facilitate or augment hearing in hearing-impaired individuals. These early experiments were the first steps in the development of the ultimate implantable EFT chip that would make the electronic commerce of the future validated and secure in a cashless society. Instead of carrying cash, instead of writing checks or using plastic cards, the people of the Final World Order might simply insert their hands into digital readers or move their foreheads into the range of eye scanners. At the same time that a scanning device reads their biometric fingerprints or iris patterns, a computer chip under their skin would make radio frequency (RF) contact with the worldwide network (likely by using near-field communication [NFC] protocols). This contact would be done digitally right through the skin with no physical sensation using wavelengths of light that easily penetrate but do not harm living tissue. In this situation, it turns out that all the advantages of RFID tags for marking products are also beneficial for marking individuals. In fact, except for the apparent interactions of the implanted chip with the electronic terminal, a person would not even realize the microprocessor was active. Before the advent of RFID technology, digital communication with a chip embedded within a person would not have been possible, because there would be no capability for direct electrical contact with terminals on the chip. 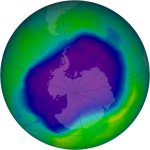 However, using RF technology the digital information transferred between the global EFT network and the smart chip can be done using digitized radio waves. Both the implanted chip and the RF scanner used to probe it have antennas that can pick up and transmit these frequencies and then transform the associated electromagnetic waves into the digital bits computer language, or the 1s and 0s that microprocessors and software can understand and use. In the mid-1980s, the organization ID Systems originally envisioned that an RFID tag could “be encapsulated in a card or tag sometimes as small as a grain of rice” (ID Systems, Dec. 1987, p. 11). In the years since that time, many forms of implantable RF identification devices have been tried in living animals with varying degrees of success. Several groups have independently developed tiny ID chips about the size of a pencil lead in diameter that could be injected just under the skin. These chips come complete with a tubular capsule surrounding an RFID transponder, an induction coil, and a capacitor, which can be activated by the appropriate RF scanner frequencies. This type of RFID chip does not contain a true microprocessor as compared to the one inside a smart card; it is designed to only store and provide an identification number back to a reader. Each chip is preprogrammed at the time of manufacture with a unique digital number, and thus every individual wearing it will also be uniquely identified. Therefore, an RF scanner could verify the true identity of any person marked with this type of device simply by correlating the retrieved number from the implanted chip with the official identity of the person in a computer database. Identification Devices, Inc. was an early pioneer in this field when they developed an RFID tag for researching salmon migration habits. 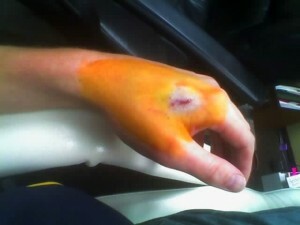 The transponder was implanted in the fish under the skin. As they swam past an RF reading station and were scanned, they could be identified by the unique ID number digitally retrieved from the implanted chip (ID Systems, Dec., 1987, p. 14). Similar forms of RFID tags for animals have been developed for research, tracking of livestock, for human diagnostics, and for human identification. Several of the more popular types of implantable devices were developed by Applied Digital Solutions, which became Digital Angel Corporation and more recently morphed into VeriTeQ (www.veriteqcorp.com). 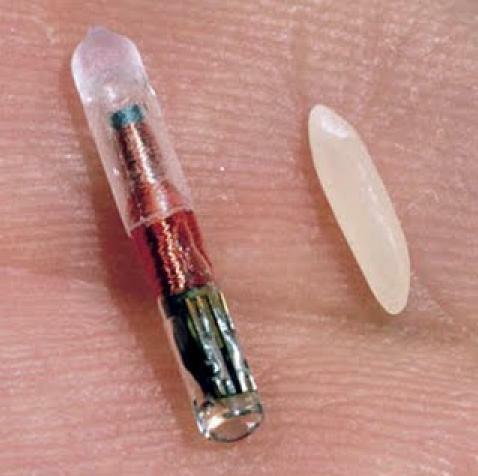 In the year 2000, Applied Digital Solutions introduced its Digital Angel microchip device that could be implanted into any living animal or human just under the skin. It consisted of a clear capsule containing an RFID transponder and an antenna, which could be injected subcutaneously using a large bore needle. Today, nearly all livestock animals present on farms as well as many household pets that people own (dogs and cats) have one of these VeriTeQ chips for identification. If you have a pet with one, it usually can be felt just under the skin between the shoulder blades on the animal’s back. A simple handheld scanner can retrieve the encoded number within the implanted RFID chip and an electronic database then can be used to correlate the animal with its owner and location of origin. VeriTeQ obtained FDA clearance in 2004 for some uses of its chips, particularly those that are designed to identify implantable medical devices. The RFID number associated with these chips can be used to correlate an implanted device to its manufacturer in addition to the serial number of the device, the place of implantation, and even the surgeon who implanted it. The RFID number also can be used to assess the age of the medical device, whether it is due for a replacement, or even identify it if a recall has been issued for a particular lot number. A new version of the RFID capsule concept has recently been created by Amal Graafstra to be NFC compliant through crowd funding support on indiegogo. Amal is actually chipped in both hands using RFID capsules (see image). The xNT implantable NFC chip is similar in appearance to the VeriTeQ chip having dimensions of 2 x 12mm, but it is also NFC Type 2 and ISO14443A compliant to be useful in many more applications. This potentially includes using it for access to secure areas, for logging onto computers and networks, to start cars, and to validate identities for commerce. The problem with routine use of these encapsulated RFID chips is that they can cause tissue trauma when injected under the skin as well as long-term medical issues, some of which can be serious. Despite the fact that they are advertised as being small and innocuous, the chips and their associated capsules are large enough to be painfully intrusive and irritating. The large bore needle needed to insert them during the procedure combined with the implantation of a relatively large object under the skin (much larger than a typical sliver, which can be very irritating) can result in considerable discomfort and swelling at the point of injection (see images). In addition, this foreign object has been shown to occasionally produce long-term effects on animal health, including the development of scar tissue, inflammation, or even epithelial tumors within the surrounding area (Albrecht, K., 2007, Microchip-Induced Tumors in Laboratory Rodents and Dogs: A Review of the Literature 1990–2006). For these reasons, it is unlikely that the RFID capsule technology currently in use will ever find widespread use as a human marking system despite the fact that some people and groups have advocated and pioneered its use for identification purposes and access control. However, the next generation RFID technology is just around the corner, and what is being developed will be far more suitable for animal and human implantation than previous devices. Several technologies use a new chipless RFID design wherein data is read using magnetic resonance, acoustic waves, or through the advanced electromagnetic properties of specialized materials. These devices transmit a digital signal back from a reader’s interrogation that correlates to a predetermined ID number. These chipless tags are considerably smaller and less invasive than RFID capsules and in fact some forms of the tags can be printed into the skin much like a tattoo. 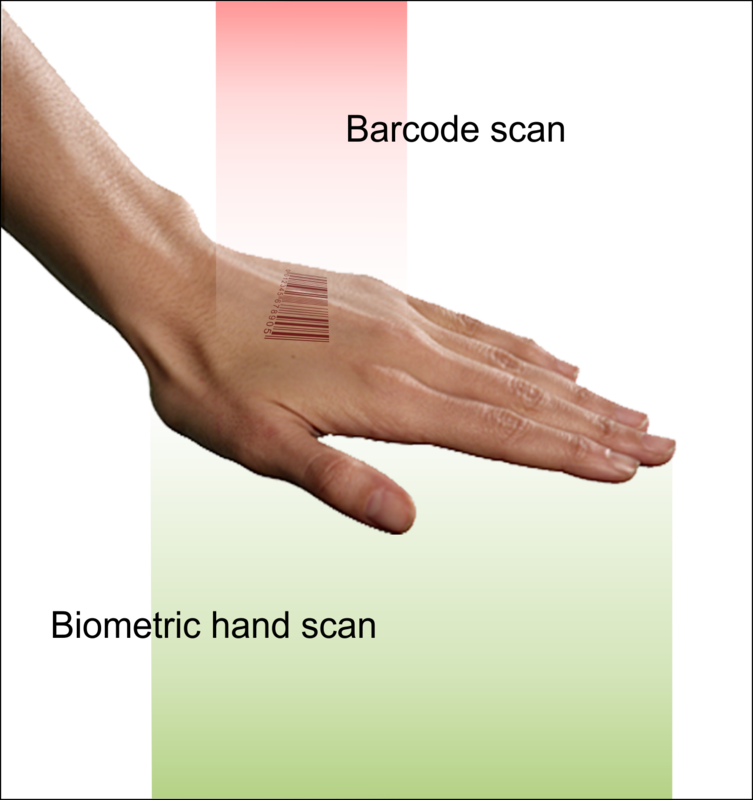 The Somark passive RFID tattoo can contain a 15 digit identification number, as required by the U.S. Department of Agriculture for marking cattle. This system could easily be used to mark humans and give each person a unique ID number, and it would be far superior to the invasive RFID capsule injection methods used currently. Today, the Somark system is being used to mark laboratory animals (e.g., mice) with a unique number to be able to identify each one for research studies. In addition, the recent development of ultra-small RFID chips might actually pave the way for microprocessor-based RFID tags to be implanted into animals and humans without harm or discomfort. Hitachi Global announced in 2006 the production of their “smart dust” chips of only 0.15 x 0.15 mm square and 7.5 microns thick (see image). They call this device the µ-Chip, which is pronounced mew-chip, wherein the Greek letter ‘µ’ stands for micron. The chip has a 128-bit digital storage capability, which is able to contain, according to its manufacturer “trillions of trillions” of number combinations for identification purposes (more precisely, it is the equivalent of 2128 or 3.4 x 1038 different ID numbers). These chips contain a 38-digit RFID number written into ROM at the time of manufacture, and are so small that they could be hidden between layers of paper (e.g., within money) or in products and clothing without being felt or easily detected, except by an RFID reader. Since its introduction, the µ-Chip has become a commercial success as an anti-counterfeiting device for products and other items. In one of its first uses, the chips were embedded into tickets to enter the Expo 2005 World’s Fair in Aichi, Japan, to prevent ticket fraud (Scientific American, Feb 2008, p. 68-71). Hitachi went on to subsequently develop an even smaller chip with dimensions of only 0.05 x 0.05 mm and 5 micron thick. These “powder” chips, as they are called, have similar capabilities to the µ-Chip, but they are 64-times smaller—much smaller in fact than the diameter of a human hair, which makes them barely visible when sitting on the skin. Hitachi research is also reportedly working on an even smaller chip, which would be only 12 microns square and far smaller than the period at the end of this sentence. Although all of the current Hitachi chips lack an antenna for RFID communication, the next generation chip is reportedly going to contain an antenna circuit directly etched within the chip. The company is also working on methods to extend the range of these antennas to permit longer distance scanning. For use in animals, Hitachi would have to coat the chip with a biocompatible layer to avoid biological reactions in animals, but this should be a trivial issue compared to the manufacture of the chip itself. The application of these RFID tags as identification devices to be placed in the hand or forehead would require a scanning range of only millimeters, which conceivably could be accomplished as the hand or eye is scanned biometrically at the same time. This upcoming RFID chip could be injected beneath the skin and literally forgotten. With its huge capacity for containing unique ID numbers, it could be easily used to mark and track every person, animal, and item in existence with a distinct RFID tag. At the same time as these developments are taking place, other groups are exploring the manufacture of microprocessors and digital circuitry on flexible substrates that can bend and stretch. John Rogers, a professor at the University of Illinois in the Material Science and Engineering department, has developed smart sensors for biomedical applications. The circuitry is formed on flexible polymer substrates instead of rigid silicon wafers, thus the devices can be shaped to conform to any biological surface. They are also more compatible with biological fluids and tissues than hard silicon chips and circuits, thus minimizing irritation or inflammation. In one application of this technology, a heart sensor array (see images) can literally be placed upon a beating heart to determine the electrical signals which are responsible for proper rhythm. This can aid in the detection and treatment of cardiac arrhythmia and perhaps even function as a pacemaker in future iterations of the technology. In the spring of 2013, Regina Dugan, the head of the Advanced Technology and Projects Group for Google’s Motorola division and the former head of DARPA, spoke at the D11 Conference and strongly advocated the use of these digital tattoos and wearable electronics for access control and to supplant passwords for online use. 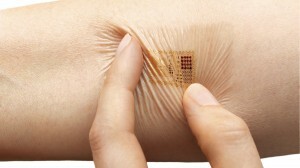 During the conference, the flexible electronics tattoo of MC10 was seen to be on her left arm. Working along similar lines, Giovanni Salvatore and his colleagues at the Swiss Federal Institute of Technology also have created flexible circuitry that is so thin it can literally wrap around a human hair. 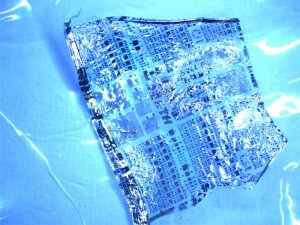 The circuits are printed on a 1 micron thick parylene polymer film, which is extremely flexible and transparent. The devices can be used even on contact lens surfaces to provide information on the internal pressure within a person’s eye. To communicate and power the devices once they are within the body, the Salvatore group is exploring the use of RF communications, which is certainly the logical next step. These types of small flexible circuits likely will be soon used to create microprocessor-based, RFID tags which could be used for external application onto the skin or internal implantation within animals and humans. Another amazing technology that has recently been developed involves the printing of circuits onto any substrate using graphene. A group of researchers in Northwestern University’s engineering department has developed a graphene ink that can be sprayed onto substrates using a device like an ink jet printer. Graphene is the latest technology in conductive organic polymers, and it consists of single-atom thick arrays of aromatic carbon atoms assembled in hexagonal shapes. This is the same molecular substance that is present in common graphite pencils, but when it is deposited in nearly a monolayer, graphene is an excellent conductor of electricity. 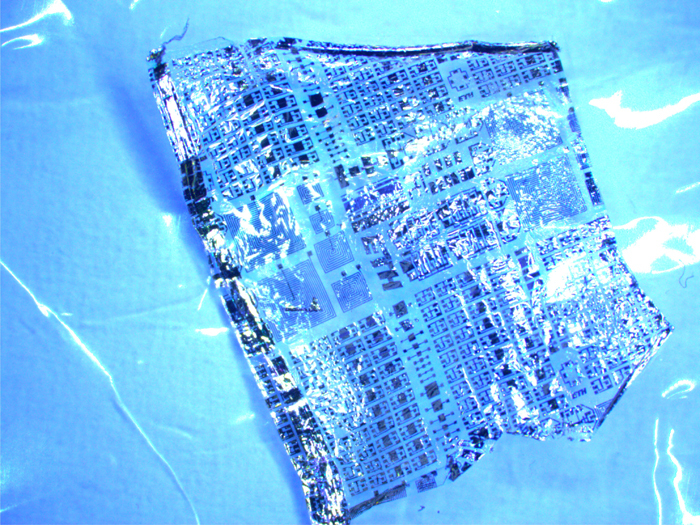 Researchers are now exploring the use of graphene to literally print microprocessor circuits onto flexible plastic substrates, thus avoiding the use of metallic connections present in all current processor chips. If this technique is perfected, it could result in a simple method to producing inexpensive RFID tags or tattoos for everything, including their use for human or animal identification. All of these options for tagging people with identifying information are rapidly being researched and developed, and many of them are being strongly advocated by government and commercial groups as methods for identifying humans or animals. At this point, it is not entirely clear which technology will become the dominate method of providing digital tattoos or implantable RFID tags for identification purposes, but it is likely that the next five years will see many companies entering the market in this arena. The ability to mark every person alive with a unique digital ID through permanent tattoos or the implantation of a micro-RFID chip is just around the corner. Seeing that these developments are taking place now, how far away can we be from the final Mark that is required to function in an electronic buying and selling environment? Do you think all this is too far-fetched to believe? 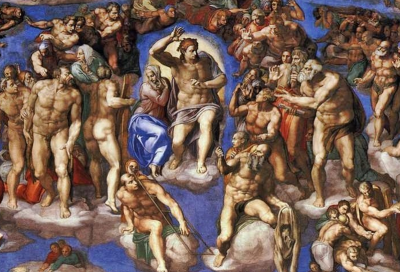 Go back and read the verses from Revelation 13 that pertain to the final Mark. The prophecy says that the Mark of the Beast will either be located in or on the hand or in or on the forehead. The word translated as in or on in the English translations is the word “epi” in the Greek, which means, according to the New Testament Greek Lexicon: “upon, on, at, by, before, of position, over, against, to, or across”. The correct translation therefore probably is on the hand or forehead, but to make the final Mark permanent, it must be put on like a tattoo or otherwise implanted subcutaneously—otherwise it would just be temporary. It is clear that before the advent of digital barcodes, electronic tattoos, and implantable RFID tags the fulfillment of the final Mark of the Beast would have been difficult if not impossible. The seven-headed, ten-horned Beast of Revelation has already arisen and is moving quickly to establish the basic infrastructure that will allow the final World Empire to operate. The electronic Cashless Society will become the rationale for creating the final Mark. The need for secure and accurate Identification will be the impetus to move the world toward the ultimate implantable chip or digital mark. There is little doubt that everything that is happening in this generation on the technological, economic, and financial fronts points toward the soon rise of the Antichrist’s system of electronic commerce. When the Antichrist is finally revealed and comes to power, the people of the New World Order will be ready for a radical transformation in society—a change that will include the total elimination of cash and the sworn allegiance of every person to the global Empire. The Antichrist will then issue a strict edict for everyone to obtain the final Mark. 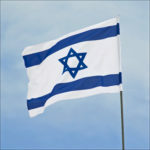 This event will be the ultimate turning point for the entire world. Anyone daring to refuse the Mark will be cut off from society; however, anyone that receives the Mark will suffer the Wrath of God and eternal damnation! That will be the final day of decision. The choices that are made will seal everyone’s destiny forever!